Use Density-Based clustering to analyze data broadcast by Eco Mini equipped on the automobile or motorcycle. 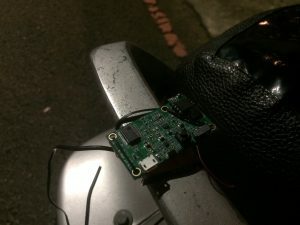 When vehicle or motorcycle pass a B4G gateway(like DSRC/WAVE RSU), this gateway will receive BLE advertisement packet, which broadcast by Eco Mini. Those package record fluctuating IMU 6-axis data as safe message. Now, with some machine learning models and data fusion techniques, we are trying to find relationship between unsafe driving style and IMU. How can we define a “dangerous driving event”? Because of the lack of open data set about this scenario, we need to figure out how to define the ground truth. In the experiment, there is a “driver” that execute a driving event, and another “helper” that responsible for labeling each driving event. 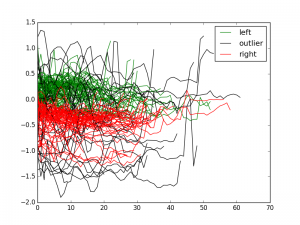 The time series motion data(called safety-message) was labeled as “danger” when the driver and experiment helper reckon this driving event is dangerous. There are two existing methods for semi-supervised clustering－constraint-based and distance-based. Density-based clustering is a distance-based clustering algorithm. For a distance-based clustering, the method of measuring distance between two points is incredibly important. In out detection system, we use dynamic time warping(DTW) to measure distance. DTW has been applied on video, audio and graphics analysis. In fact, any temporal sequence data can be analyzed with DTW. The time complexity of DTW is O(n*n) so that there is an issue about fast computation. Accordingly, cDTW may be implement in the future work. The research about how to apply cDTW on our system is the point we focus on now.